Belkin’s Dyle mobile TV is a TV antenna that works with an iOS device. With the Dyle iOS app installed, you can watch broadcast TV on your iPad or iPhone—but only under certain, rather limited conditions. Before investing in the Dyle mobile TV, check to see if you’re in Dyle’s coverage area. The device doesn’t pick up the broadcast signal used by a real TV with a DTV antenna—the kind of signal that’s available in most places. Instead, Dyle mobile TV uses a mobile video broadcast signal called ATSC-MH, and right now, it’s available in fewer than 40 U.S. metropolitan areas. The Dyle mobile TV connected to an iPhone 4S. The Dyle app offers a listing of what's on the channels available in your area. Before we move to the hands-on review, there’s one other major limitation to mention. The Dyle mobile TV antenna has a 30-pin connector, and Belkin does not list any Lightning-equipped iOS devices on the Dyle mobile TV’s compatibility list (nor does it list any iPod touch models). I was able to get the device to work with an iPhone 4S and an iPad 2 without any problems. Though Belkin makes no mention of using the Dyle mobile TV antenna with a $29 Lightning to 30-pin adapter, I tried it anyway with an adapter and the fourth-generation iPad. The iPad seemed to recognize the Dyle mobile TV device—I was asked to allow the Dyle app to “communicate with the Belkin Mobile TV”—but when using the Dyle app, I got errors stating that the receiver wasn’t connected. 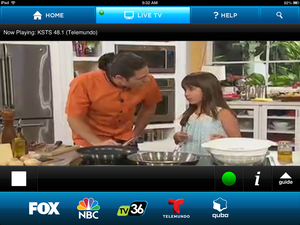 To watch TV with a Dyle mobile TV connected to your device, you need to download the free Dyle iOS app. 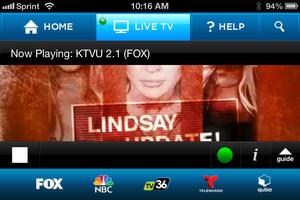 You watch TV shows via the app, which offers only a channel and program listing. The Dyle app always needs to perform a scan to see what channels are available at the time you are tuning in. There’s always a chance you’ll be in an area where the Dyle can’t get good reception, despite the fact that the Dyle website says an area is covered. For example, San Francisco is in Dyle’s coverage area, but the Dyle mobile TV can’t get a reception in my home in the southwest section of the city, but in the downtown offices of IDG Consumer & SMB (our parent company), the Dyle had no reception problems. The jaggy image quality is much more noticeable on the iPad, shown here. On the iPhone 4S, the video quality looks acceptable—the small screen helps hide the pixelation. On the iPad, the video is pixelated, but tolerable if you’re used to watching low-quality videos on YouTube. In general, there are frustrating quirks to using the device. I frequently got errors stating that the receiver wasn’t connected when it was. When I left the Dyle app to do something else and then went back into the Dyle app, I was often asked to grant permission again for the app to communicate with the device—not really a big deal, but it becomes annoying when you see the alert every time. In households with one or two TVs, the Dyle mobile TV could come in handy when it works—since Fox is available in my area, I can use it to watch what I want to watch while the rest of my family watches something else. However, the Dyle FAQ says that the service will be “available with no subscription fee through the end of 2013,” which means there’s a possibility that Dyle may charge for its services at the beginning of next year. Will people be willing to pay for a service with such severe limitations? I’m not. If Dyle can get more channels and wider coverage, and Belkin improves the app and receiver functionality, the Dyle mobile TV becomes a more interesting product, fee or no fee. Editor's note: Updated at 7:35 p.m. PT on 11/27/13 with a revision about watching games during the football season, and added a statement about broadcast blackouts and NFL games. 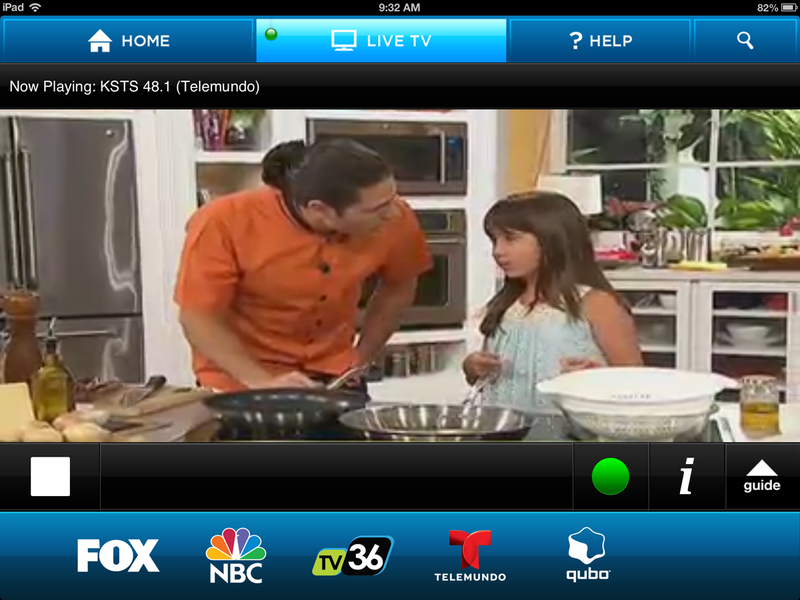 The Dyle mobile TV is a nice idea, but it needs a lot of improvements to make it feel like it's worth the money.